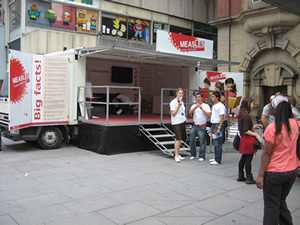 Today I did a little demo in front of the Measles Roadshow in Nottingham with Chris and Sarah, Louise and Megan Fisher, family of Georgie who died after MMR. Over at our spot their crew descended on our little gang of five angrily saying our children were not dead or damaged from the MMR! Unbelievable! I had to ask one of their older less attractive female tribe not to talk to Sarah like she was, so bossily, after what she'd been through. Sarah can take care of herself and waded straight in there, but was being wound up a treat by this unsympathetic bunch, she is such a feisty soul to put herself through this sort of direct action which she does in the memory of her little boy how she stays so strong I'll never know. Our very presence made them cross. One by one they came over and ranted and then called for security to get us to go. We weren't quite 'kettled' but we WERE surrounded. A burly Victoria SC security guard and his equally hefty sidekick informed me this was private property, and we should move on, I explained what we were doing he then winked as he told me that if I stepped over the grate to my left I would be off their property and so immoveable. Three community police hovered around us the entire time and one proper policeman to our left and four security men stayed put too. The PR team boss (mid to late 20's - miss busy-body) wanted rid of us, then a male (who kindly gave us a glass of water with the intention of gleaning more info) took photos of our banners. The whole group gathered up to hold a meeting not unlike an American Football Team huddle. Out came wadges of brochures, the girls staked pavement spots all around us and aimed to beat us to every young mum. We were outnumbered handsomely BUT WE HAD put the wind up them that's for sure. Their phones were hot!!! We had a generous and interested share of the public approaching us though too, mostly supportive. Positioned at the Clock Tower entrance of a rather seedy 1960's edifice, the Victoria Shopping Centre the lorry is eye-catching crewed by a determined bunch - or at least they were when we turned up. I phoned Central News and a news team duly arrived it wasn't until they spent more time than was comfortable with the lorry crew, that I realised there is a news story in the offing but controlled in a 'for and against' way, completely orchestrated by the Dept of Health, Immunisations as part of their PR package. 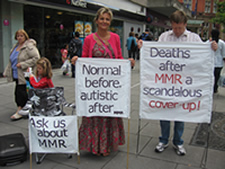 The AGAINST MMR filming, I was told was being conducted elsewhere, in the WEST midlands, this being the EAST. I said I was from the west, could they give me the reporter's number,....no, they only had his email. I worked on them because I could see they had gathered vox pop interviews and wides and pictures of us, but none speaking as yet, just as they unplugged they relented at my persistence and gave me an interview. As they positioned themselves, Miss Busybody shot over and tried to Direct the interview by demanding that they didn't include the lorry in the background with our banners and gang in the foreground, they then turned on the generator so the sound was distorted, all this as workmen filled a hole in the pavement next to us and a street sweeper car made four rounds over us, telly cameras make shopping centres bosses nervous obviously!!! Undeterred I laid into them, pointing out the obstacles they laid in front of us to prevent us speaking, they were starting to get how unfair it was. However, I have no positive feelings from this interview, I felt they were humouring me particularly when every sentence the reporter uttered began with "I am not going to lie to you......we might not use it". The fact that I had driven over 75 miles, taken time out from caring for my autistic son AND paid out of my own pocket to do it was the clincher...Chris and Sarah had come from farther away Gloucester he wasn't keen on talking to us following their briefing from Miss Busybody. I rang Sky News, the BBC and no joy. No editors would take it up. Local radio station were there already on site but doing the DoH bidding. I gave it a whirl too much to their annoyance. Let's hope they have to ponder the thought we may at some other point turn up and do this again! Below are some EXTRACTS from the brochure. Most people have already made up their mind about what they think of vaccines by the time they have children. Some get whatever's on the schedule, no questions asked. A few vehemently oppose vaccinations and won't be swayed by any facts presented. The following is really for people who want more info before closing their eyes, crossing their fingers and jumping (a time honoured, metaphorical pertinent decision-making technique). Despite the claims of many anti-vaccine lobbyists, the dedicated medical staff who immunise children are, hey, probably not part of some bizarre, worldwide, shifty-eyed conspiracy to make money for drug companies, and probably not brainwashed, robotic devotees of weird science. And it seems equally evident that sadly a very, very, small number of individual children among millions may be harmed by a vaccine. In a perfect world each child's reactions would be perfectly predictable, each child with a medical predisposition would have obvious symptoms, and each vaccine dose would be tailored to the levels of immunity in each child without needing blood to be taken with yet another injection. Ultimately parents will have to weigh up the tiny statistical risk for their child against the protection from dangerous diseases. Some anti-vaccination activists have said that mercury in childhood vaccines was causing health problems. As there is no mercury (thimerosal) used in any of the UK injections on the routine schedule for kids there is no point in arguing the issue here, although the idea has been discredited. Despite the claims of most anti-vaccination books and websites, you can be assured that all routine childhood vaccines are free of mercury. If you are worried, ask your doctor to get out the list of ingredients from the packet and take you through them. There is a tiny amount of gelatin in one brand of MMR vaccine. But, the Muslim Council of Britain advises muslims they are duty bound to use life-saving preventative measures and the World Health Organisation (WHO) website carries a statement endorsed by many Islamic medical scholars saying that the transformed gelatin can be considered pure and permissible to consume. For a while there was a lot of publicity about whether the MMR vaccine caused autism. Now we know it doesn't. It was a disagreement between all of the medical doctors in the world except for a tiny, tiny handful, versus some parents of sick children who suspected some damage was caused by the MMR vaccine. Some parents were concerned about giving three vaccines in one jab, preferring three injections spaced over time. This is because they believed that the immune system is too challenged by a multiple vaccine: another theory that doctors say has no supporting evidence and is disproven by the vast number of successful triple jabs. In the late 1990's a UK digestion doctor called Andrew Wakefield worried parents by saying the MMR vaccine was linked to, or may cause, autism. His claims have now been totally disproved by every other study done previously or since on MMR and autism rates, and all reputable immune system and infectious diseases specialists. So now we know that MMR does not cause autism, nor do other vaccines. I tried to find an anti-vaccination book or website that seems perfectly sober and reasonable. God knows I tried. But to be candid, I only found nutty ones. This is one of the reasons why the writings are almost always self-published - big publishing houses and magazines won't touch them. Most of the authors fervently claimed that immunisation doesn't prevent disease - which is demonstrably not true. Almost all books, websites and articles in "alternative" magazines quote the same handful of self-described researchers or experts. You should be aware that many anti-vaccination websites are books repeat (as facts) claims that have been disproved - such as that vaccines cause autism, sudden infant death syndrome or cancer and that germs do not cause disease - or are unprovable. Most give lots of statistics, often obviously quoting from each other rather than primary sources, but on further investigation the statistics are selectively used or plain wrongly interpreted. Their info is almost always irrelevant to the UK (it's worth repeating that there's no mercury, known as thimerosal in routine UK child vaccines. The have said immunisation causes (variously) shaken baby syndrome, asthma, attention deficit disorder - in fact anything that has statistically risen since the introduction of vaccination including, to single out one US anti-vaccine activist, criminal behaviour (there is a whole book on the theory). 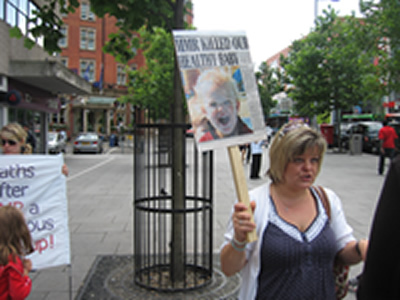 Brian Deer's website by saying; A respected British investigative reporter wraps up the Dr Wakefield anti-MMR campaign story. A British journo and doctor, Ben Goldacre runs a funny and entertaining site while he's being serious about why homeopathy won't work any better than a sugar pill, how the anti-MMR rumours gained such a following despite being utterly wrong, and how hopeless most reporters and TV Shows are when explaining science. Autism's False Prophets: Bad Science, Risky Medicine and the Search for The Cure. Mr Allen uses his long experience as a journalist to detail the history of vaccines including a clear-eyed cataloguing of the problems, and covers the fight against polio, the eradication of smallpox, the anti-vaccination movement and the autism controversy.